Riles on Wigmore as a "Legal Amatuer"
Academics in the humanities and social sciences have often remarked upon the “amateuristic” quality of the analytical tools used by legal scholars. Rather than dismiss this quality out of hand, this paper approaches “legal amateurism” as a practice of knowledge production that can be studied ethnographically. The type of academic work produced by legal scholars expresses a unique relationship between scholarship and practice that bears the imprint of both the Formalist and Realist legal traditions. A certain degree of amateuristic scholarship, especially if it pertains to topics outside of one’s immediate area of expertise, provides legal professionals with a space for thought, reflection, and play – elements that are experienced as sorely lacking in today’s fast-paced, highly technological world. While amateur, non-monetized work can be a way to accrue symbolic capital or demonstrate a certain level of privilege, it also offers legal professionals the opportunity to refresh and renew their commitment to their own work and the legal profession more generally. 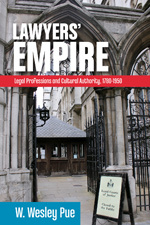 Drawing on examples from the eccentric scholarship of John Henry Wigmore, as well as the drafting of technical documents in a Japanese bank, this paper argues that a certain aesthetic of amateurism lies at the heart of what it means to be a legal professional today. Martha S. Jones, University of Michigan, here, advises that you “take off your historian’s hat” before watching "13th," Ava DuVernay’s film about mass incarceration, on Netflix. The annual Katherine Preyer panel at the ASLH is designed to recognize and promote excellent scholarship by early career scholars in legal history, honoring the generosity and acumen of the late Kitty Preyer. Each year, a committee reads submitted papers, and generally chooses two exemplary works. The two authors, whose travel to and registration for the annual meeting are covered by the Preyer fund, present their work. Two senior commentators in their respective fields comment. This year, Catherine Evans (Harvard University) presented "Crime, Punishment, and the Indigenous Subject in Colonial Canada." Her paper is a study of an extraordinary criminal case, which involved murder charges against three Cree men, who ranged in age from 85 to 18. All were accused of the ritual killing of an elderly Cree woman, who was suspected of (and apparently believed herself to be) a wendigo, a cannibalistic spirit that occupied human hosts and brought ruin on native communities. Colonial and imperial reactions to the murder, Evans argues, revealed the limits of settler sovereignty, in part because judges were required to cover vast swaths of territory. Equally important, one judge in the case argued that none of the defendants, who admitted the killing but claimed it was justified in Cree culture, had the necessary mens rea to sustain a murder conviction. The relationship between settler law and assumptions about civilization, native "savagery," and criminal law illustrate the limited success of Canadian legal norms and Native resistance to the cultural imperialism of the British Empire. Giuliana Perrone (UCSB) presented "Slaves into Citizens: Legitimizing of Black Domestic Relationships in Reconstruction-Era State Courts," a study based on hundreds of state appellate court opinions in former slave states (both border and Confederate jurisdictions). These cases were brought by former slaves or their families to legitimate or challenge claims to marriage. In each case, family members or putative spouses argued about how and whether a marriage had been formed, and if so whether it should be treated in law as on-going. Because such issues were decided on a state-by-state basis, Perrone argues, inconsistency traveled deep into the law of marriage. At the same time, questions of what counted as "legal marriage" emerged with force after the Civil War. Especially because former slaves lacked a "legal past," Perrone maintains, they became both emblematic of new standards for all marriages, but also victims of discriminatory and arbitrary rulings. 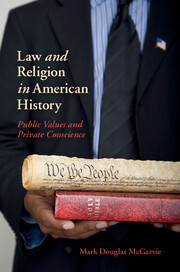 McGarvie's "Law and Religion in American History"
This book furthers dialogue on the separation of church and state with an approach that emphasizes intellectual history and the constitutional theory that underlies American society. Mark Douglas McGarvie explains that the founding fathers of America considered the right of conscience to be an individual right, to be protected against governmental interference. While the religion clauses enunciated this right, its true protection occurred in the creation of separate public and private spheres. Religion and the churches were placed in the private sector. Yet, politically active Christians have intermittently mounted challenges to this bifurcation in calling for a greater public role for Christian faith and morality in American society. Both students and scholars will learn much from this intellectual history of law and religion that contextualizes a four-hundred-year-old ideological struggle. The New York Times reviews Tyler Anbinder's City of Dreams: The 400-Year Epic History of Immigrant New York. Historian Tiya Miles reviews Colin Dickey's Ghostland: An American History in Haunted Places. Also in The New York Times is a review of Mike Jay's This Way Madness Lies: The Asylum and Beyond. 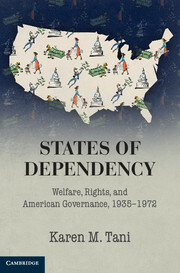 States of Dependency: Welfare, Rights, and American Governance, 1935-1972 by LHB blogger Karen Tani has been reviewed in an essay on H-NET. The New Books Network interviews Ethan Michaeli about his The Defender: How The Legendary Black Newspaper Changed America. The site also has an interview with Matthew Dallek about his Defenseless Under the Night: The Roosevelt Years and the Origins of Homeland Security. In the New Statesman is a review of Richard J. Evans' The Pursuit of Power: Europe 1815-1914. Caliphate: The History of an Idea by Hugh Kennedy is reviewed in The Washington Post. The New Yorker reviews Esther Schor's Bridge of Words: Esperanto and the Dream of a Universal Language. The New Rambler Review has a review of Benjamin Straumann's Crisis and Constitutionalism: Roman Political Thought from the Fall of the Republic to the Age of Revolution. 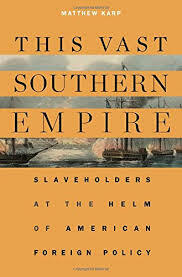 At Dissent, Matthew Karp speaks about his just released This Vast Southern Empire Slaveholders at the Helm of American Foreign Policy. The Economist reviews together Blanche Wiesen Cook's Eleanor Roosevelt: The War Years and After, 1939-1962 and Susan Quinn's Eleanor and Hick: The Love Affair That Shaped a First Lady. Wiesen Cook's Eleanor is also reviewed in the Chicago Tribune. History Today has a review of John Bew's Citizen Clem: A Biography of Attlee. Bew is also interviewed by the New Books Network about his biography of Atlee. The History and Public Policy Program of the Woodrow Wilson International Center for Scholars seeks interns for the Cold War International History Project, the Nuclear Proliferation International History Project, and the North Korea International Documentation Project. Deadline: November 6. More. “Retired Oregon State University professor of history William G. Robbins will give a talk entitled, “The Malheur Occupation and Public Lands in the West” at 2 p.m. Saturday [i.e., today] in the Moreland Gallery at the Benton County Historical Museum.” H/t: Philomath Express. ICYMI: H-Law podcaster Siobhan Barco interviews Sara L. Crosby on Poisonous Muse: The Female Poisoner and the Framing of Popular Authorship in Jacksonian America. "Roger Brooks Taney Was as Bad as You Think"; Michael Ramsey on Seth Barrett Tillman on the Presentment Clause. If you're missing out on this year's meeting of the American Society for Legal History, you can follow the conversation on Twitter. Search for #ASLH2016. And for blog readers who are there, keep those tweets coming! Norman I. Silber, Hofstra University School of Law, has posted Monroe Freedman and the Morality of Dishonesty: Multidimensional Legal Ethics as a Cold War Imperative, which appears in the Hofstra Law Review 44 (2016): 1127-60. This Article reaches into the personal history of Monroe Freedman, a pioneer in multi-dimensional legal ethics, to advance an explanation for his advocacy and his signal contributions to legal ethics - particularly his landmark article of 1966, Professional Responsibility of the Criminal Defense Lawyer: The Three Hardest Questions, where he inquired into situations in which candor might not be either moral or professional. It argues that his outspoken defense of lying as sometimes necessary and even moral behavior in the adversary system should be understood as an outgrowth of his early religious perspective about the nature of moral obligations, as well as a response to excesses of the Cold War that touched him personally. It contends that Monroe’s confidence in the fundamental fairness of government rules, processes, and punishments—and that of hundreds of other young lawyers - was undermined by experience with the National Lawyers Guild, inquisitions, and FBI surveillance during the 1950s, and that understanding the history does at least as much to explain his attitude about ethics in an adversary system as his better-known encounters with the problems of criminal defense lawyers in more immediate contexts. Focusing on these earlier events offers insight not just into Monroe and the genesis of his position in that article, but offers an alternative explanation for the modern development of multidimensional professional ethics. There is perhaps no more critical juncture in American history than the years in which Americans drafted the federal Constitution, fiercely debated its merits and failings, and adopted it, albeit with reservations. In Contested Conventions, senior historian Melvin Yazawa examines the political and ideological clashes that accompanied the transformation of the country from a loose confederation of states to a more perfect union. Treating the 1787–1789 period as a whole, the book highlights the contingent nature of the struggle to establish the Constitution and brings into focus the overriding concern of the framers and ratifiers, who struggled to counter what Alexander Hamilton identified as the "centrifugal" forces driving Americans toward a disastrous disunion. This concern inspired the delegates in Philadelphia to resolve through compromise the two most divisive confrontations of the Constitutional Convention—representation in the new Congress and slavery—and was instrumental in gaining ratification even in states where Antifederalist delegates comprised a substantial majority. Arguing that the debates over ratification reflected competing ideas about the meaning of American nationhood, Yazawa illuminates the nature of the crisis that necessitated the meeting at Philadelphia in the first place. Contested Conventions is a cohesive and compelling account of the defining issues that led to the establishment of the Constitution; it should appeal to history students and scholars alike. This past weekend saw some legal history action at the 45th Annual Conference on South Asia in Madison, Wisconsin. The conference has a tradition of one-day preconferences, including the South Asia Legal Studies Preconference. The program this year included a talk by David Gilmartin (North Carolina State), "Custom as a Category: Empire and Water Law in British India." There was also a keynote address by Justice Chelameswar Jasti of the Indian Supreme Court on the selection of judges in India, including a fascinating discussion of India's rejection of the American model for the appointment of Supreme Court judges during the Constituent Assembly debates of 1947-50. At the main conference, this blogger caught a few talks on the history of international law with a South Asian spin. International lawyer and former UN official Radhika Coomaraswamy gave the Joseph W. Elder Keynote Lecture. Over the past few decades, academics have undermined the value of human rights in conflict zones by construing them as neo-colonial western exports, argued Commaraswamy. SJD student Priyasha Saksena (Harvard Law School) also spoke on the history of international law. She situated legal battles between British India and the princely states within the larger history of international law. And in fact it was the week of global legal history in Madison. Harshan Kumarasingham (Max Planck Institute for European Legal History) gave a lecture at the University of Wisconsin Law School a few days earlier on the role of Sir Ivor Jennings in constitution-writing across the de-colonizing former British Empire. One example of what Kumarasingham calls the "Eastminster" model was Ceylon. The conference also included a poster session for the first time. One poster dealt with a recent legal development that is being watched closely by medico-legal scholars everywhere. Earlier in 2016, the government of India effectively banned the previously unregulated industry that made India the "surrogacy hub" of the world. Jana Fedtke (American University of Sharjah) explored literary depictions of the transnational industry in its pre-ban heyday. Historians of law and reproduction will soon enough rush in to work on this chapter of Indian legal history. McBride, "Mr. Mothercountry: The Man Who Made the Rule of Law"
Today, every continent retains elements of the legal code distributed by the British empire. The British empire created a legal footprint along with political, economic, cultural and racial ones. One of the central problems of political theory is the insurmountable gap between ideas and their realization. Keally McBride argues that understanding the presently fraught state of the concept of the rule of law around the globe relies upon understanding how it was first introduced and then practiced through colonial administration--as well as unraveling the ideas and practices of those who instituted it. The astonishing fact of the matter is that for thirty years, between 1814 and 1844, virtually all of the laws in the British Empire were reviewed, approved or discarded by one individual: James Stephen, disparagingly known as "Mr. Mothercountry." Virtually every single act that was passed by a colony made its way to his desk, from a levy to improve sanitation, to an officer's pay, to laws around migration and immigration, and tariffs on products. Stephen, great-grandfather of Virginia Woolf, was an ardent abolitionist, and he saw his role as a legal protector of the most dispossessed. When confronted by acts that could not be overturned by reference to British law that he found objectionable, he would make arguments in the name of the "natural law" of justice and equity. He truly believed that law could be a force for good and equity at the same time that he was frustrated by the existence of laws that he saw as abhorrent. 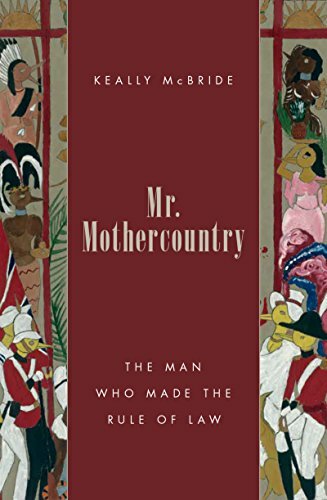 In Mr. Mothercountry, McBride draws on original archival research of the writings of Stephen and his descendants, as well as the Macaulay family, two major lineages of legal administrators in the British colonies, to explore the gap between the ideal of the rule of law and the ways in which it was practiced and enforced. McBride does this to show that there is no way of claiming that law is always a force for good or simply an ideological cover for oppression. It is both. Her ultimate intent is to illuminate the failures of liberal notions of legality in the international sphere and to trace the power disparities and historical trajectories that have accompanied this failure. This book explores the intertwining histories of colonial power and the idea of the rule of law, in both the past and the present, and it asks what the historical legacy of British Colonialism means for how different groups view international law today. John C. Domino (Sam Houston State University), “The Origins and Development of Judicial Recusal in Texas,” British Journal of American Legal Studies, Vol. 5, Issue 1 (May 2016), 1-28. In 21st century Texas, a judge’s decision to recuse from a case is based on a complex set of norms, codes and procedures intended to promote impartiality. For most of the state’s history, however, the sole ground for the removal of a judge from a case was not recusal for bias but disqualification based on rigid conditions set out in the Texas Constitution. This article examines the foundations and emergence of the modern concept of judicial recusal in Texas with the intent to illustrate a shift from rigid constitutional grounds to a more fluid approach based on judicial interpretation of a code of conduct. The author concludes that while Texas disqualification and recusal jurisprudence is conservative and restrained, it remains to be seen whether this restraint can continue unchanged in a post-Caperton era. The Caperton probability of bias standard has become part of the dialogue on recusal and disqualification in Texas, but Caperton-based challenges are unlikely to prevail in the near future because many members of the bench and bar share the belief that the state’s judicial campaign contribution restrictions and recusal jurisprudence create a firewall against violations of the Due Process Clause. The risk, however, is that continued resistance to change may further erode public confidence in existing ethical safeguards and fall short of assuaging concerns that wealthy donors continue to exercise disproportionate influence on the judiciary. CFP: Global Legal Regimes: Beyond Imperial Frames. April 20-21, 2017. Inaugural workshop of the Global History Initiative, Queen’s University, Kingston. How do the concepts and methods of global history illuminate, enrich and complicate legal history scholarship? What are the global processes, concepts and problems that might be illuminated through a legal archive? How does the study of legal cases shed light on cultural, economic and political interactions between societies and nations? How do legal regimes enable, and restrict, the movement of people around the globe? The workshop will be held on April 20-21 at Queen’s University in Kingston, Ontario, with a keynote delivered by Prof. Jeremy Adelman, the Henry Charles Lea Professor of History and Director of the Global History Lab at Princeton University. Please send 300-word abstracts and a brief c.v. including contact details to ghiq@queensu.ca with the subject "Legal History workshop” by Dec. 15, 2016. Selected participants will be notified by January 1 and invited to submit complete drafts of their papers for pre-circulation by April 1, 2017. Participants will read all pre-circulated papers, make a brief presentation on their own work, and comment on another paper. The Global History Initiative will fund accommodation and some meals for all participants, who will be expected to make their own arrangements for travel to Kingston, Ontario. 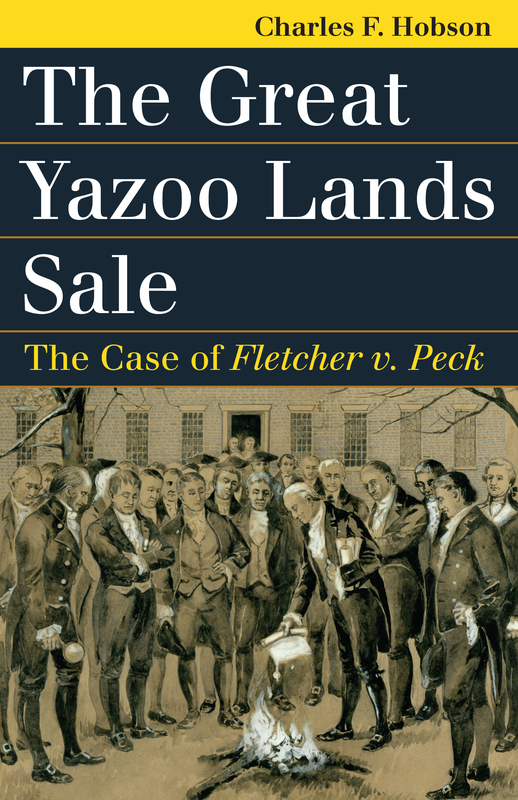 I want to draw the attention of my fellow aficionados of the history of administrative law and procedure to a recently published (and, unfortunately, gated) article by a former student of mine, Reed Abrahamson, now an associate at Drinker Biddle & Reath LLP. It is "The Ideal of Administrative Justice": Reforming Deportation at the Department of Labor, 1938-1940,” Georgetown Immigration Law Journal 29 (2015): 321-49. The article treats the work and findings of a committee within the Department of Labor, the home, since 1913, of the Immigration Service, tasked by Secretary Frances Perkins to study deportation procedures. It performed its duties in extremely contentious circumstances. During its labors, partisans found administrative procedure to be a useful stick with which to beat the New Deal, and the attempted deportation of West Coast labor leader Harry Bridges became a cause celebre. After President Franklin D. Roosevelt transferred the immigration service to the Department of Justice, the committee’s recommendations were never implemented. Still, its history, recovered by Mr. Abramson from the Department of Labor’s records at the National Archives and Henry M. Hart’s papers at the Harvard Law School, is instructive. Not the least reason was the difference in outlook between the committee’s two most important members, the law professor (and protégé of Felix Frankfurter) Hart and a public administrations expert, Marshall Dimock. It also complements the better-known story of a contemporaneous study group, the Attorney General’s Committee on Administrative Procedure. From 1938 to 1940, Frances Perkins presided over a second wave of efforts to reform the Immigration and Naturalization Service until the Service 's eventual transfer to the Department of Justice from the Department of Labor in 1940. These reforms were lead by a committee that included, at an early stage in their careers, prominent scholars Henry Hart and Marshall Dimock. From 1939 to 1940, the committee's suggestions for expanding the due process rights afforded to immigrants in deportation proceedings were rolled out on a trial basis. Grounded in the Supreme Court's decisions on administrative decision-making and a humanitarian desire to improve the treatment of immigrants, the committee's recommendations expanded the procedural and substantive protections available to aliens. Ultimately, these reform efforts did not make a lasting impact, likely due to the interdepartmental transfer of the Service and the onset of World War I. The Supreme Court would briefly adopt some of the committee's suggestions following the passage of the Administrative Procedure Act, until Congressional action altered the legal framework in which deportations took place. Although the long-term impact of the committee's recommendations proved limited, its work demonstrates an alternative vision of the Immigration and Naturalization Service that emerged late in the New Deal period. How does the appearance of racial difference shape our view of citizenship and national identity? This Article seeks to address that question by examining two early twentieth-century cases involving the naturalization of Indian immigrants in the United States. In United States v. Bhagat Singh Thind (1923), the Supreme Court determined that "Hindus" were not eligible for citizenship under the terms of the Naturalization Act because they were not "white persons." The Court recognized that, although individual immigrants from India had proven themselves capable of cultural assimilation, as a group, they were disqualified because they would remain visually unassimilable. Through a close reading of the Court's analysis, this Article examines the way in which law participates in the visual construction of both national identity and racial difference. Dinshah P. Ghadiali was one of several Indian immigrants whom the United States sought to denaturalize in the wake of Thind. Since the Court had announced that visual assimilability was the relevant test for naturalization, Ghadiali found himself in the peculiar position of having to defend his citizenship by demonstrating to a judge that he looked white. At his denaturalization trial, Ghadiali submitted into evidence several photographs of himself, his children, and his properties, assuring the judge, "You will see my family became so American." Through these photographs, I explore the demands of visual conformity that the law imposes on racialized minorities. Finally, this Article seeks to introduce to comparative legal scholarship a method of engaging the reflections of minority subjects to challenge the received authority of legal texts, a method I call a "minor comparativism." Is originalism toothless? Richard Posner seems to think so. He writes that repeated theorizing by "intelligent originalists," one of us happily included, has rendered the theory "incoherent" and capable of supporting almost any result. We appreciate the attention, but we fear we've been misunderstood. Our view is that originalism permits arguments from precedent, changed circumstances, or whatever you like, but only to the extent that they lawfully derive from the law of the founding. This kind of originalism, surprisingly common in American legal practice, is catholic in theory but exacting in application. It might look tame, but it has bite. Many of the books reviewed this week are more on the -ish side of legal history-ish (along with a lot of biography). Together, however, they offer interesting reading. 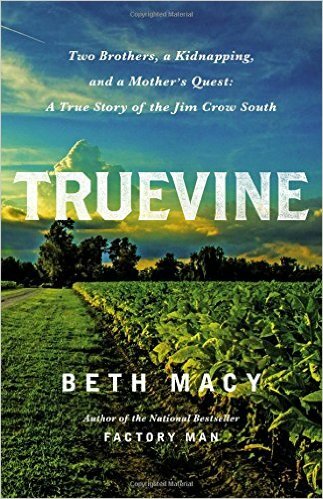 In this week's New York Times, Edward Baptist reviews Beth Macy's Truevine: Two Brothers, a Kidnapping, and a Mother's Quest: A True Story of the Jim Crow South (Beth Macy is also interviewed on NPR here and here). Also in the NYT is a review of Gareth Stedman Jones' biography of Marx, Karl Marx: Greatness and Illusion. Finally this week's NYT carries a review of Ron Robin's The Cold World They Made: The Strategic Legacy of Roberta and Albert Wohlstetter. Beth Macy's Truevine has also inspired a review essay in the New Republic. 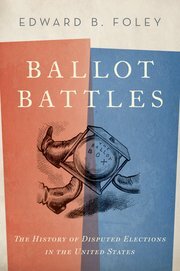 In the New York Review of Books is a review essay on voting rights that draws on Ari Berman's Give Us the Ballot: The Modern Struggle for Voting Rights in America and Zachary Roth's The Great Suppression: Voting Rights, Corporate Cash, and the Conservative Assault on Democracy. 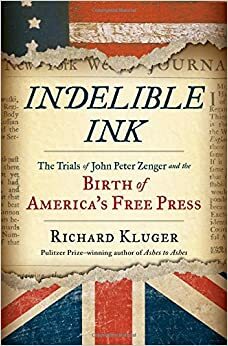 In the Los Angeles Review of Books is a review of Richard Kluger's Indelible Ink: The Trials of John Peter Zenger and the Birth of America's Free Press. In the London Review of Books Susan Pedersen reviews Robert Vitalis' White World Order, Black Power Politics: The Birth of American International Relations. There has been a spate of presidential biographies reviewed this week. H.W. Brands' The General vs. the President: MacArthur and Truman at the Brink of Nuclear War is reviewed in the Los Angeles Times. American Ulysses: A Life of Ulysses S. Grant by Ronald C. White is reviewed in the NYT and the Chicago Tribune. Finally, Robert Strauss is interviewed on NPR about his Worst. President. Ever. : James Buchanan, the POTUS Rating Game, and the Legacy of the Least of the Lesser Presidents. 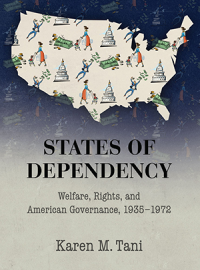 Elizabeth Hinton's From the War on Poverty to the War on Crime is reviewed at HNN. Also reviewed at HNN is Roxanne Dunbar Ortiz and Dina Gilio Whitaker's "All the Real Indians Died Off": And 20 Other Myths About Native Americans. James Kloppenberg is interviewed at the New Books Network about his Toward Democracy: The Struggle for Self-Rule in European and American Thought. Caroline Winterer is also interviewed there about her American Enlightenments: Pursuing Happiness in the Age of Reason. Finally, there is an interview with Natalie Byfield on her Savage Portrayals: Race, Media and the Central Park Jogger Story. In The New Rambler Review is a review of Richard Tuck's The Sleeping Sovereign: The Invention of Modern Democracy. In The Wall Street Journal John Fabian Witt reviews Philanthropy in Democratic Societies: History, Institutions, Values, edited by Rob Reich, Chiara Cordelli, and Lucy Bernholz. Mark A. Graber, the Jacob A France Professor of Constitutionalism at the University of Maryland Francis King Carey School of Law, has been named a University System of Maryland Regents Professor. “Graber is one of just seven Regents Professors in the history of the University System of Maryland.” More. Judith Adkins, “These People Are Frightened to Death”: Congressional Investigations and the Lavender Scare, Prologue, 48 (Summer 2016), 6–20. Recent issues of the Louisiana Law Review have included some good legal history: Slavery Under the Thirteenth Amendment: Race and the Law of Crime and Punishment in the Post-Civil War South, by Virginia Tech’s Peter Wallenstein. A Translator's Toolbox: The Law, Moreau-Lislet's Library, and the Presence of Multilingual Dictionaries in Nineteenth-Century Louisiana by Agustín Parise. And On the Bicentenary of the Louisiana Supreme Court: Chronicle of the Creation of a Unique and Beautiful Legal Tradition by A. N. Yiannopoulos. "Wayne State's Walter P. Reuther Library of Labor and Urban Affairs will be the permanent home of Detroit-artist Walter Speck’s historic New-Deal era UAW mural. 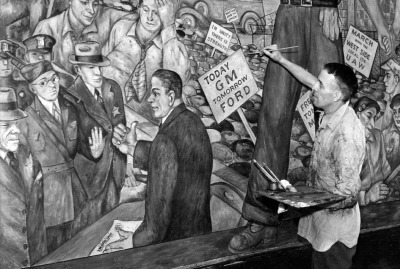 The mural depicts significant events in the UAW’s history, and for more than 75 years it was displayed at the Local 174’s union halls.” It was unveiled yesterday during a ceremony during the 38th Annual North American Labor History Conference, which continues today at Wayne State. More. ICYMI: Canadian legal history sessions at the ASLH meeting in Toronto, via Canadian Legal History Blog. Laura Edwards’s appointment as the 2016-17 William H. Neukom Fellows Research Chair in Diversity and Law makes it to Bloomberg Law. Seth Barrett Tillman on The Journals Clause. "We're far removed from the Federalist Papers," laments Roger Pilon, after the third presidential debate. We say: Sad! Do say hello to your LHB Bloggers if you see us at #ASLH2016. We're always happy to hear from you! This Essay pays tribute to Daniel Meltzer’s insight that, to the extent “lawyers have a common intellectual heritage, the federal courts are its primary source.” I do so by analyzing how that heritage is made and remade, as political forces press Congress to deploy federal courts to protect a wide array of interests and state courts absorb the bulk of litigation. Our friends at Queen Mary University of London announce the following history-related events sponsored by that university’s Centre for Law and Society in a Global Context (CLSGC). A new book symposium organized by the CLSGC for Peter Cane's book Controlling Administrative Power: A Comparative History (CUP). 4:00 - 7:00pm. Room 313, School of Law, Queen Mary University of London, Mile End Road, London. Chair: Professor Sionaidh Douglas-Scott (Queen Mary). Speakers: Professor Peter Cane (ANU), Professor Peter Lindseth (UConn), Professor Alison Young (Oxford), Professor Liz Fisher (Oxford). Professor Paul Craig (Oxford). A special seminar with Professor Robert W. Gordon discussing "The Return of the Corporate Lawyer-Statesman?" Co-hosted by CLSGC, the London School of Economics, and the Institute of Advanced Legal Studies. 3:30 - 5:30pm. Institute of Advanced Legal Studies, Charles Clore House, 17 Russell Square, London. A new book symposium on the Oxford Handbook of Roman Law and Society, organized by CLSGC and chaired by Dr Maks Del Mar (Queen Mary). 4:00 - 7:00pm. Room 313, Third Floor, Law Building, Queen Mary University of London, Mile End Road. A CLSGC workshop on the Comparative History of Legal Reasoning. Chair: Dr Maks Del Mar. Global Jurists Seminar Two: Global Jurists in History. Part of the seminar series on Global Jurists: Past, Present and Future, organized by the Centre for European and International Legal Affairs and CLSGC and chaired by Professor Georgios Varouxakis (QMUL). 4:15 - 7:00pm. Venue TBC, Queen Mary University of London, Mile End Road, London. Speakers: Arnulf Becker Lorca (US), Dr Shruti Kapila (UK), Rohit De (US), Dr Katharina Rietzler (UK), Mira Siegelberg (QMUL), Dr Natasha Wheatley (AUS). A Symposium on Pue's "Lawyers' Empire"
Martin Lederman, Georgetown University Law Center, has posted The Law (?) of the Lincoln Assassination. Shortly after John Wilkes Booth killed Abraham Lincoln, President Andrew Johnson directed that Booth’s alleged coconspirators be tried in a makeshift military tribunal, rather than in the Article III court that was open for business just a few blocks from Ford’s Theater. Johnson’s decision implicated a fundamental constitutional question that had been a source of heated debate throughout the Civil War: When, if ever, may the federal government circumvent Article III’s requirements of a criminal trial by jury, with an independent, tenure-protected judge presiding, by trying individuals other than members of the armed forces in a military tribunal? 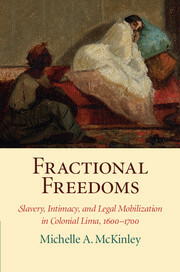 Fractional Freedoms explores how thousands of slaves in colonial Peru were able to secure their freedom, keep their families intact, negotiate lower self-purchase prices, and arrange transfers of ownership by filing legal claims. Through extensive archival research, Michelle McKinley excavates the experiences of enslaved women whose historical footprint is barely visible in the official record. She complicates the way we think about life under slavery and demonstrates the degree to which slaves were able to exercise their own agency, despite being caught up in the Atlantic slave trade. Enslaved women are situated as legal actors who had overlapping identities as wives, mothers, mistresses, wet-nurses and day-wage domestics, and these experiences within the urban working environment are shown to condition their identities as slaves. Although the outcomes of their lawsuits varied, Fractional Freedoms demonstrates how enslaved women used channels of affection and intimacy to press for liberty and prevent the generational transmission of enslavement to their children. Professor McKinley discusses her book in a video on the Studies in Legal History's website. If you are attending the American Society for Legal History meeting next week in Toronto, the Legal History Blog welcomes your guest post about any panels you attend. (Examples of the type of coverage we're looking for are here, here, here and here.) We like to do this for the benefit of those who cannot attend, as well as for those who find themselves torn between competing panels. As always, the program looks very strong. To sign up for guest post(s), please email us. No technical expertise is required -- we take care of that for you. Twitter updates would also be great. Following last year's success with #ASLH2015, we suggest the hashtag #ASLH2016. Looking forward to seeing many of you in Toronto! Travel safe. Deadline: Applications are to be sent by 31 March 2017. The Max-Planck Summer Academy for Legal History provides a selected group of highly motivated early-stage graduates, usually PhD candidates, an in-depth introduction to methods and principles of research in legal history. The academy consists of two parts. The first part provides an introduction to the study of sources, methodological principles, as well as theoretical models and controversial research debates on basic research fields of legal history. In the second part the participants discuss the special research theme and develop their own approach to the theme. The course will take place at the Max Planck Institute for European Legal History in Frankfurt am Main, Germany. Special theme 2017: Conflict Regulation Conflict is not just a constant challenge for the law, but also a key means of access to its history. Each society develops its own set of means of conflict regulation. The diversity ranges from different forms of dispute resolution and mediation to traditional juridical procedures at local and global level. The way conflicts are regulated reveals the normative options chosen by the parties involved in the conflict. Thus, conflicts and their regulation can provide an insight into local contingencies, traditions, as well as the pragmatic contexts and leading authorities of the law, the living law. Research projects to be presented at the Summer Academy should concentrate on historical mechanisms of conflict regulation and offer a critical reflection about the methods used for analyzing the conflicts and the way they are dealt with. • Working knowledge of English is required, German is not a prerequisite. Required documents for the application are a CV, a project summary (approx. 10 pages) and a letter of motivation. There is no participation fee. Accommodation will be provided by the organizers. Participants, however, will be responsible for covering their travel expenses. There will be a limited number of scholarships available. 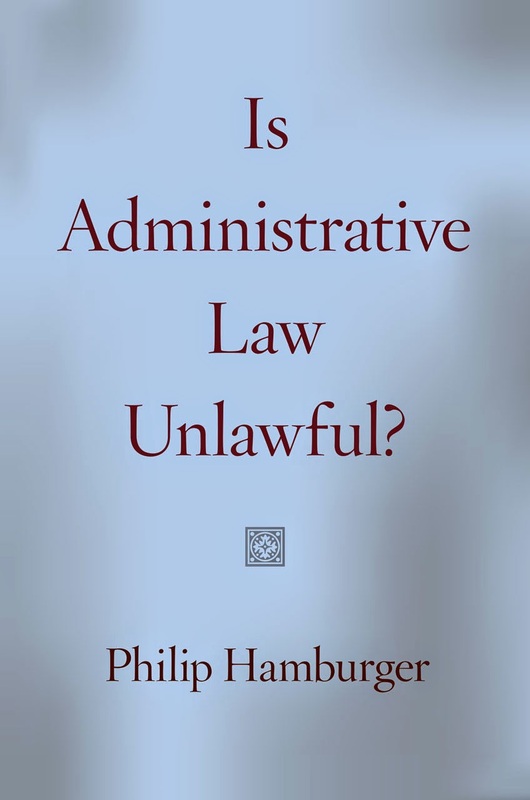 Philip Hamburger posed a provocative challenge to administrative law in the USA, as attested to by the title to the book, which asked whether administrative law was unlawful. His thesis was grounded in English administrative law, as it developed in the seventeenth century and eighteenth centuries, when lawyers in the American colonies would have been familiar with it. 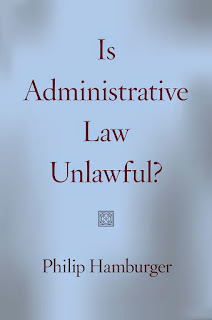 It is central to Hamburger’s argument that much of administrative law concerning both rulemaking and adjudication was “extralegal” and was thus regarded by English law during this period. In an earlier article I argued that this thesis was wrong as adjudged by positivist and non-positivist sources alike. Hamburger responded to my article, and took issue with the argument made therein. This article is a response to Hamburger’s latest offering. The flaws in Hamburger’s argument are even clearer now than hitherto, and there are numerous such mistakes. This article will, however, concentrate on four errors that are central to his thesis. 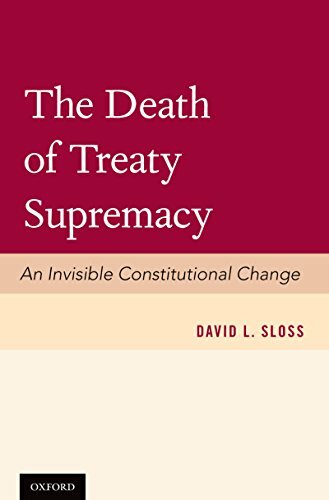 This book provides the first detailed history of the Constitution's treaty supremacy rule. It describes a process of invisible constitutional change. The traditional supremacy rule provided that all treaties supersede conflicting state laws; it precluded state governments from violating U.S. treaty obligations. Before 1945, treaty supremacy and self-execution were independent doctrines. Supremacy governed the relationship between treaties and state law. 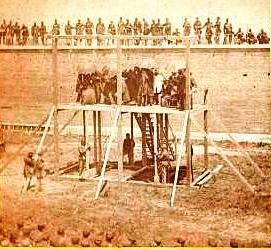 Self-execution governed the division of power over treaty implementation between Congress and the President. In 1945, the U.S. ratified the UN Charter, which obligates nations to promote human rights "for all without distinction as to race." In 1950, a California court applied the Charter's human rights provisions and the traditional treaty supremacy rule to invalidate a state law that discriminated against Japanese nationals. The implications were shocking: the decision implied that the United States had effectively abrogated Jim Crow laws throughout the South by ratifying the UN Charter. In response, conservatives mobilized support for a constitutional amendment, known as the Bricker Amendment, to abolish the treaty supremacy rule. The amendment never passed, but Bricker's supporters achieved their goals through de facto constitutional change. The de facto Bricker Amendment created a novel exception to the treaty supremacy rule for non-self-executing (NSE) treaties. The exception permits state governments to violate NSE treaties without authorization from the federal political branches. The death of treaty supremacy has significant implications for U.S. foreign policy and for U.S. compliance with its treaty obligations. "The Death of Treaty Supremacy makes a major contribution to our understanding of American constitutionalism. It demonstrates the evolutionary nature of constitutional law, identifies the complex practical forces that drive its evolution, and highlights yet another flaw in constitutional 'originalism.' It shows that historical changes have transformed the Constitution's meaning even on an issue where the 'original' meaning was actually clear and specific--that properly ratified treaties are 'supreme' over state law." 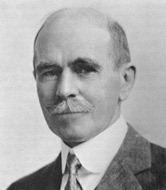 -Edward A. Purcell Jr. The introduction is available here, on SSRN. The BHC Doctoral Colloquium in Business History will be held once again in conjunction with the 2017 BHC annual meeting. This prestigious workshop, funded by Cambridge University Press, will take place in Denver Wednesday March 29 and Thursday March 30. Typically limited to ten students, the colloquium is open to early stage doctoral candidates pursuing dissertation research within the broad field of business history, from any relevant discipline. Topics (see link for past examples) may range from the early modern era to the present, and explore societies across the globe. Participants work intensively with a distinguished group of BHC-affiliated scholars (including at least two BHC officers), discussing dissertation proposals, relevant literatures and research strategies, and career trajectories. Applications are due by 15 November 2016 via email to BHC@Hagley.org should include: a statement of interest; CV; preliminary or final dissertation prospectus (10-15 pages); and a letter of support from your dissertation supervisor (or prospective supervisor). Questions about the colloquium should be sent to its director, Edward Balleisen, eballeis@duke.edu. All participants receive a stipend that partially defrays travel costs to the annual meeting. Applicants will receive notification of the selection committee’s decisions by 20 December 2016. This article deals with the history of the Chilean Legal Aid Service from its creation in 1932 until the 1960s, the institution that served as the main legal intermediary between the lower classes and the justice system. 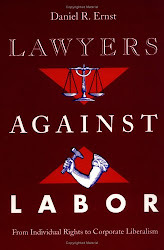 By focusing on how the Legal Aid Service’s professional staff — lawyers and social workers — used this institution to define their professional identity, and on how they conceived of their role as mediators, I argue that this institution promoted a system of legal intermediation that privileged conciliation over contentious litigation, and that it worked as a multiple-layered screen between popular demands and the justice system. This reveals why, in comparison to the progressive inclusion of the poor in new welfare state agencies in mid-twentieth century Chile, the judicial system appeared as a conservative and exclusionary force: legal aid had precisely for purpose that the most radical demands could not reach the courts. 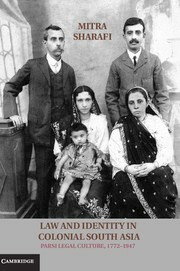 By examining the lives of the 83 judges--Britons and Indians--who served on the Bombay High Court during the colonial era, and by exploring the court's colonial past, this book attempts to understand why British colonial institutions like the Bombay High Court flourished even after India became independent. In the process, this book unravels the complex changes that took place in Indian society, the legal profession, the law, and legal culture during the colonial era. Following on (finally!) from the Legal Histories of the British Empire conference in Singapore in 2012, we are pleased to announce "Legal History and Empires: Perspectives from the Colonized," jointly sponsored by the Faculty of Law and Faculty of Humanities and Education, University of the West Indies, Cave Hill Campus, Barbados, 11-13 July 2018. A website and CFP will be announced in the new year. It’s a way off, but as we know July is always busy, so here is a heads up! Save the Date! For preliminary inquires please contact Shaunnagh Dorsett (shaunnagh.dorsett@uts.edu.au) or Asya Ostroukh (asya.ostroukh@cavehill.uwi.edu). 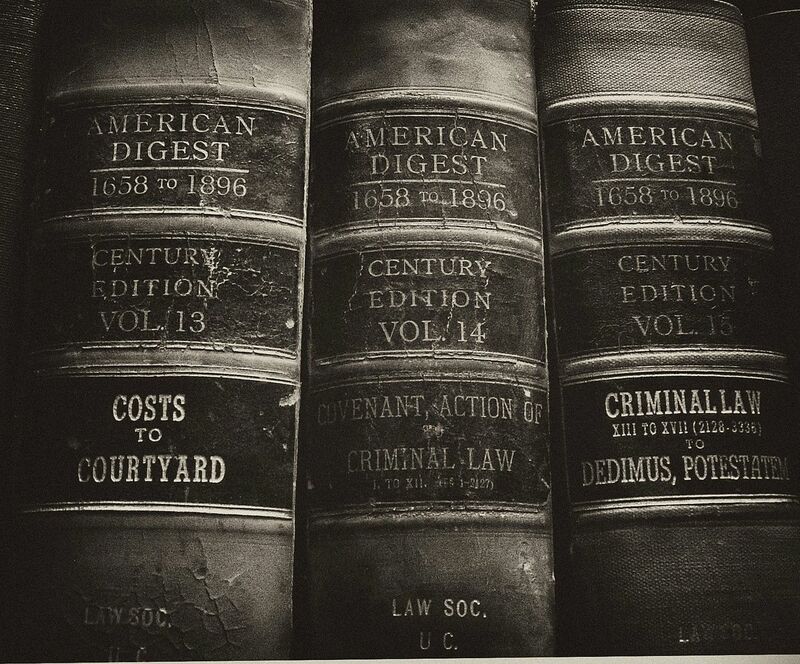 Here's a roundup of some legal history related book reviews published this week. Those of you whose Sunday morning begins with a visit to the Legal History Blog may have noticed that it is tardy. My apologies! Reviewers and publishers are thinking about voting rights these days (I can’t imagine why…). 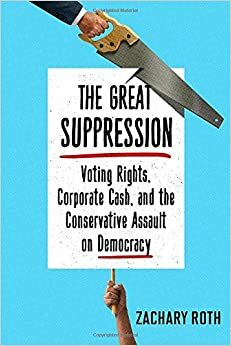 In the NYRB, David Cole’s How Voting Rights Are Being Rigged covers Give Us the Ballot: The Modern Struggle for Voting Rights in America by Ari Berman and The Great Suppression: Voting Rights, Corporate Cash, and the Conservative Assault on Democracy by Zachary Roth. In The New Republic, Alan Wolfe takes on Roth’s book as well as Jason Brennan’s Against Democracy, which “argues for the establishment of an epistocracy, or rule by the wise.” (IQ tests at the voting booth? How could that possibly go wrong...?). Also in the NYRB, Gerard Russell reviews three books on the recent political movements in the Middle East by Jean-Pierre Filiu, Thanassis Cambanis and Robert F. Worth. In the same issue, James McPherson reviews a new history of abolition by Manisha Sinha and Ian Johnson reviews four books on the Cultural Revolution-- Guobin Yang’s The Red Guard Generation and Political Activism in China, Frank Dikötter’s The Cultural Revolution: A People’s History, 1962–1976, Yang Kuisong’s “Bianyuanren” Jishi [A Record of “Marginal People”]; an edited volume entitled Maoism at the Grassroots: Everyday Life in China’s Era of High Socialism, and The Secret Archives of the Cultural Revolution in Guangxi, an eighteen-part report on the Cultural Revolution made from 1986 to 1988 under the instructions of reformist Party leader Hu Yaobang. In the Washington Post, Mary Louise Kelly, NPR’s National Security correspondent, reviews Rogue Heroes, Ben Macintyre’s “riveting new history” of Britain’s Special Air Service—or SAS. Macintyre’s book is also reviewed in The Guardian. Also in The Guardian, Colin Kidd summarizes Ron Chernow’s biography of Alexander Hamilton, which is being published for the first time in the UK as a “taster” for the musical’s opening in London in 2017. In the Times Literary Supplement, Stephen Lovell reviews The Romanovs by Simon Sebag Montefiore, which has a “gossipy charm that readers will recognize from his earlier work” and as it looks into the “inner chambers” of the Russian dynasty. In The Nation, ﻿Jedediah Purdy reviews John Judis’s The Populist Explosion: How the Great Recession Transformed American and European Politics and What Is Populism? Jan-Werner Müller’s take on populism in Western Europe. In the LA Review of Books, Amy Brady reviews Richard Kluger’s, Indelible Ink: The Trials of John Peter Zenger and the Birth of America’s Free Press, which “tells the complex and thoroughly engaging history leading up to and including the moment of Zenger’s trial for seditious libel of a government figure,” and Stephen Rhode reviews two new books on the death penalty, Courting Death: The Supreme Court and Capital Punishment (which provides “a clear and comprehensive look at the 40-year modern history of capital punishment in the United States since its reinstatement in 1976”) and Against the Death Penalty (which provides an introduction to Justice Breyer’s dissenting opinion on the death penalty in Glossip v. Gross (2015) and “could chart the legal roadmap to ending this irreversible form of criminal punishment.”). This month’s issue of The Federal Lawyer features reviews of Mervyn King’s The End of Alchemy: Money, Banking, and the Future of the Global Economy (review by Christopher C. Faille), Melvin I. Urofsky’s Dissent and the Supreme Court: Its Role in the Court’s History and the Nation’s Constitutional Dialogue (review by John C. Holmes), Nick Bunker’s An Empire on the Edge: How Britain Came to Fight America (review by proud Rhode Islander Neysa M. Slater-Chandler) and Shoba Sivaprasad Wadhia’s Beyond Deportation: The Role of Prosecutorial Discretion in Immigration Cases (review by R. Mark Frey). Lanni on Why Study Athenian Law? Chicago Law and the "Tradition of Restraint"
Salaymeh's "Beginnings of Islamic Law"